Removal of the dangerous and congested level crossing on Camp Road in Campbellfield is set to start later this year – improving safety and travel times for the 20,000 vehicles that drive through the area each day. Local MP, Frank McGuire unveiled concept designs today and announced that rail-under-road is now the preferred solution for the project. A number of other options were investigated but ruled out as they would have required major re-routing of Camp Road, significant realignment of Sydney Road or major alterations to the Western Ring Road. The Camp Road level crossing is one of Melbourne’s worst, with three accidents and fifteen near misses in the last decade alone. Getting rid of it will reduce congestion, improve safety and create hundreds of jobs in Campbellfield, which will have flow-on benefits for local businesses. 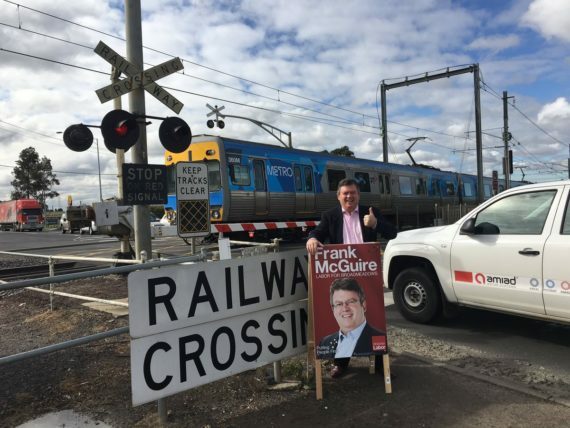 The level crossing will be the first to go as part of the North Western package, which will also remove crossings at Buckley Street in Essendon, Glenroy Road in Glenroy, Bell Street in Coburg and Moreland Road in Brunswick. The Labor Government is not wasting a moment getting rid of the worst level crossings across Melbourne. Eight are already gone, 12 are under construction and seven more will start this year. By the end of 2018, 37 level crossing removals will be either finished or underway, with 50 crossings to go by 2022. For information and to sign up for updates, visit levelcrossings.vic.gov.au.